(Phys.org)—IBM scientists have been able to differentiate the chemical bonds in individual molecules for the first time using a technique known as noncontact atomic force microscopy (AFM). The results push the exploration of using molecules and atoms at the smallest scale and could be important for studying graphene devices, which are currently being explored by both industry and academia for applications including highbandwidth wireless communication and electronic displays. "We found two different contrast mechanisms to distinguish bonds. The first one is based on small differences in the force measured above the bonds. We expected this kind of contrast but it was a challenge to resolve," said IBM scientist Leo Gross. "The second contrast mechanism really came as a surprise: Bonds appeared with different lengths in AFM measurements. With the help of ab initio calculations we found that the tilting of the carbon monoxide molecule at the tip apex is the cause of this contrast." 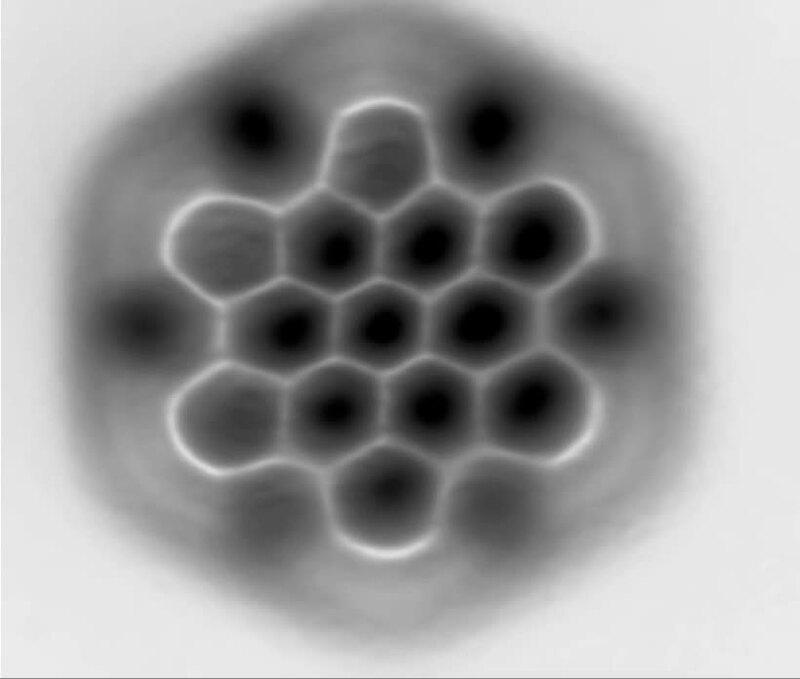 As reported in the cover story of the September 14 issue of Science magazine, IBM Research scientists imaged the bond order and length of individual carboncarbon bonds in C60, also known as a buckyball for its football shape and two planar polycyclic aromatic hydrocarbons (PAHs), which resemble small flakes of graphene. The PAHs were synthesized by Centro de Investigación en Química Biolóxica e Materiais Moleculares (CIQUS) at the Universidade de Santiago de Compostela and Centre National de la Recherche Scientifique (CNRS) in Toulouse. The individual bonds between carbon atoms in such molecules differ subtly in their length and strength. All the important chemical, electronic, and optical properties of such molecules are related to the differences of bonds in the polyaromatic systems. Now, for the first time, these differences were detected for both individual molecules and bonds. This can increase basic understanding at the level of individual molecules, important for research on novel electronic devices, organic solar cells, and organic light-emitting diodes (OLEDs). In particular, the relaxation of bonds around defects in graphene as well as the changing of bonds in chemical reactions and in excited states could potentially be studied. 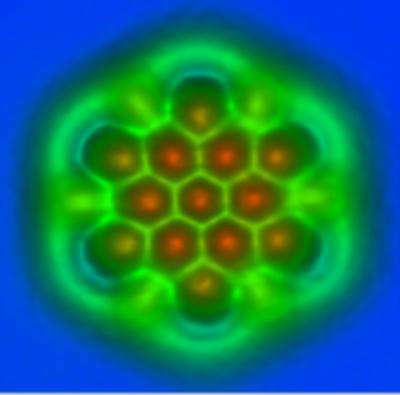 As in their earlier research "The Chemical Structure of a Molecule Resolved by Atomic Force Microscopy" the IBM scientists used an atomic force microscope (AFM) with a tip that is terminated with a single carbon monoxide (CO) molecule. This tip oscillates with a tiny amplitude above the sample to measure the forces between the tip and the sample, such as a molecule, to create an image. The CO termination of the tip acts as a powerful magnifying glass to reveal the atomic structure of the molecule, including its bonds. This made it possible to distinguish individual bonds that differ only by 3 picometers or 3 × 10-12 m, which is about one-hundredth of an atom's diameter. In previous research the team succeeded in imaging the chemical structure of a molecule, but not the subtle differences of the bonds. Discriminating bond order is close to the current resolution limit of the technique and often other effects obscure the contrast related to bond order. Therefore the scientists had to select and synthesize molecules in which perturbing background effects could be ruled out. To corroborate the experimental findings and gain further insight into the exact nature of the contrast mechanisms, the team performed first-principles density functional theory calculations. Thereby they calculated the tilting of the CO molecule at the tip apex that occurs during imaging. They found how this tilting yields a magnification and the very sharp images of the bonds. We show that the different bond orders of individual carbon-carbon bonds in polycyclic aromatic hydrocarbons and fullerenes can be distinguished by noncontact atomic force microscopy (AFM) with a carbon monoxide (CO)–functionalized tip. We found two different contrast mechanisms, which were corroborated by density functional theory calculations: The greater electron density in bonds of higher bond order led to a stronger Pauli repulsion, which enhanced the brightness of these bonds in high-resolution AFM images. The apparent bond length in the AFM images decreased with increasing bond order because of tilting of the CO molecule at the tip apex. What a surprise. Atoms form the tetrahedron Merkaba structure so as to fractally nest EM phase waves. The six sides of this tetrahedron are in fact a picture of the fundamental standing wave nodes which appear on any 3D vibrating sphere. A tetrahedron is the most stable, and compact geometric 3D shape. Or maybe it's because those are Carbon atoms that each form 4 bonds. The green lines are the bonds, aren't they? Actually a fixed 3D geometric shape of 2D planes and no 3D hard particles makes sense and is evidence they really are the most fundamental elements. Simple planar elements without structure. No different than one-dimensional string making a quark. You can even see the tetrahedrons in the first photo making the characteristic "star of David" from a flattened view. 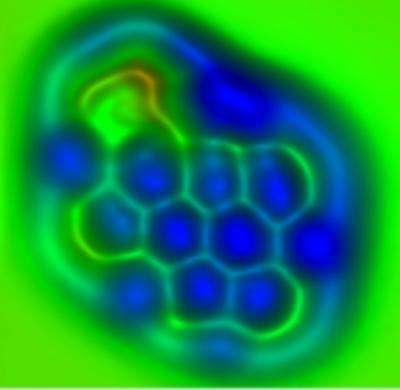 In the picture of hexabenzocoronene the green hexagon lattice are the carbon atoms and the bonds and the hydrogen atoms are the green wispy parts with bonds on the outside. What are the red and yellow balls inside the lattice? Does this not mean a chemical bond is real distributed matter? According to the Copenhagen interpretation it should be a "probability-distribution" for two electrons. Thus ALL probable positions suddenly manifest simultaneously! Wow!! I think this is incontrovertible proof that the probability interpretation is just plain BS: Sorry Max! ^Yes, but this is not a snapshot. It takes some time to generate this image, moving the tip over the whole thing. So the tip can be hit many many times by the same electron. When i say hit i mean influenced, since it's non contact. Come-on: Why do you guys want to believe in Voodoo? Because Bohr was superstitious? The bond is a real matter-wave having a real intensity proportional to its mass-energy. All harmonic waves EVER known have intensities proportional to their energies, but suddenly this is supposedly not possible for electron-waves. You want to rather believe that electrons "know" when we look at them so that they must be "self-aware"; that what we do at present affects the past (Wheeler's stupidity! ), and similar bollox; while real electron-waves can be modelled in a causal fashion? Why do modern physicists demand to live in cloud cucku land? BTW: I can create a macro electron-wave consisting of millions of fused electrons (not just two as in this bond) and you can see this wave with a light microscope. Please, release Video for Firefox Browsers. @johanfprins: Your interpretation about my interpretation of quantum physics makes no sense. You're putting words in my mouth...words that make no sense. I did not "interpret your interpreation" since I do not even know what "your interpreation" is. And Where did I put words in your mouth? Can you be a bit more specific, please?